Earth from Space: Gosses Bluff Crater, Northern Territory of Australia. For Asteroid Day, the Copernicus Sentinel-2A satellite takes us over the Gosses Bluff crater in the Northern Territory of Australia. The crater is visible in the left centre of the image and it is about 22 km in diameter. It was most likely formed 140 million years ago by the impact of a large comet or meteorite slamming into the surface of Earth. This false-colour image shows an extremely dry area with some vegetation visible in reddish colours along the rivers and lakes. 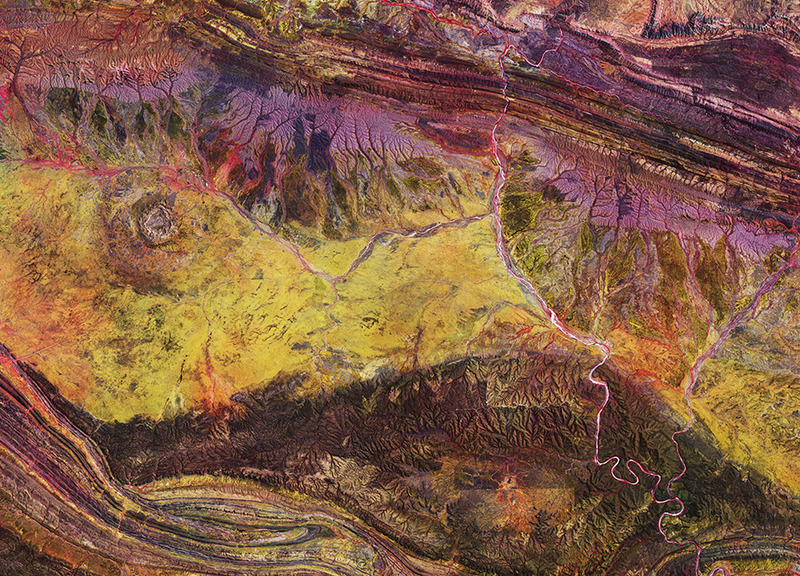 The intense colours of the image represent the mineral composition of the land surface, which is clearly visible owing to the lack of vegetation. Azurite is one of the minerals mined here. A series of low hills and drainage structures can be seen in the lower part of the image, a result of erosion over the years. The West MacDonell Ranges can be seen in the upper section of the image and part of the Petermann Ranges are shown in the lower section. The crater is around 200 km west of Alice Springs, famous for being the gateway to the Red Centre, Australia's interior desert region. Asteroid Day brings people from around the world together to learn about asteroids, the impact hazard they may pose, and what we can do to protect our planet, families, communities, and future generations from asteroid impacts. It takes place on 30 June each year, which is the anniversary of the largest asteroid impact in recent history, the 1908 Tunguska event in Siberia. This year, ESA is co-hosting a live webcast with the European Southern Observatory packed with expert interviews, news on some of the most recent asteroid science results, and the truth about the dinosaurs. Watch 30 June at 13:00 CEST via www.esa.int/asteroidday. This image, which was captured on 4 February 2016, is also featured on the Earth from Space video programme.